Offering you a complete choice of products which include ss bellows, stainless steel bellows and industrial bellow. Our offered range of SS Bellows are manufactured from high grade quality material, these are tested on various quality parameter by our professional team. Experience of handling all type of critical application in all kind of industries. We can design and manufacture in all types of expansion bellows. 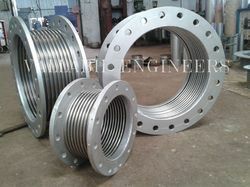 The offered range of Industrial Bellow is known for their unmatched quality and unbeatable price in the market. Manufactured using premium grade raw material, our products are widely appreciated by the customers for their excellent results.